Forthcoming events at or for The Swan. Please click or hover over the event to get more details. We will be having another volunteeering day. When we get closer to the day, we will publish a list of tasks, etc that your help will be required with. We can guarantee that there will be a lot to do. Our volunteering days have been very successful so far in moving the restoration along at pace and also bonding the community. We will soon have a new community pub in Windsor, it's not there yet, but we are getting excited! This is a chance to have an informal evening of food, drink and music in the historic courtyard of the Swan. Bring your friends. It's not too late to join the Bevy and get involved in this brilliant project, so come and have a sneaky beak at what is going on. All welcome. We will ask you to sign-up for this in advance. The countown will be started shortly. Did you attend these events? If you have any photos or feedback, we would appreciate if you would share on our social media sites. Thanks in advance. 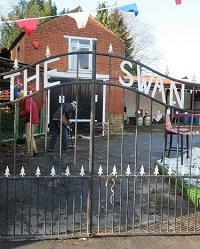 We really want to build a good history of The Swan going forward. As you will see when you select the events below, you will find our new photo galleries. These are work in porgress but give you a flavour of what has happened. Can be summed up as .... WOW! Over 150 people went to the gig. They sang. They danced. They got hoarse. The Skangsters did not disappoint playing a wide range of ska with energy and gusto. An excellent night. Thanks to the guys for contributing to the restoration funds. The volunteers were out again on Saturday. They tackled a variety of tasks including sanding, sanding and more sanding. The gents toilet was also cleared along with lots of rubble from the main bar area. Yet another outstanding turnout by the community. Much progress was made that allowed scaffolding to go up on Monday 4th. The team tackled a multitude of tasks from wallpaper stripping in the B&B rooms, to lifing the lino in the kitchn, to removing the last of the plaster in the bar area. Some photos about the day can be found in this Photo Gallery. A huge thank you to everyone who came along for our site clearance weekend. We have exceeded our orginal plans and managed to start with some major internal work. Our Photo Gallery for the Site Clearance Weekend has just started. We will be adding more photos very soon. Nearly two hundred people joined us to celebrate completing the deal and collecting the keys. Will Cavert and Richard Allen talked about the next steps and overall plan. We also shared some beer, squash and cakes. Please see Instagram, Facebook and Twitter too. This site was created and is maintained by a volunteer without the use of any website tools.